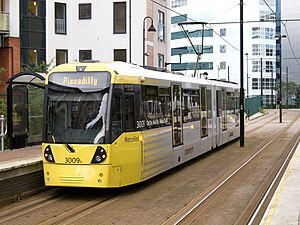 ^ "A new generation of trams for Greater Manchester". Metrolink. Archived from the original on 13 November 2012. Retrieved 15 March 2013. ^ "New Metrolink ticket zones". 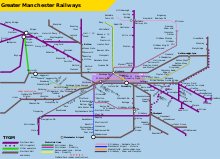 Transport for Greater Manchester (TfGM). Retrieved 5 December 2018. ^ "Work: a taster". Hemisphere Design and Marketing Consultants. 2008. Archived from the original on 22 April 2008. Retrieved 13 June 2009. ^ "Tram design on the right track". Manchester Evening News. 14 October 2008. Archived from the original on 3 April 2015. Retrieved 31 January 2009. ^ "Linking It All Up". Infoletter. Dalton Maag. March 2009. Archived from the original on 20 February 2012. Retrieved 20 June 2009. ^ "New look for new trams". GMPTE. 8 October 2008. Archived from the original on 2 March 2012. Retrieved 20 June 2009. ^ "Looking out for your safety" (PDF). Transport for Greater Manchester. Retrieved 27 March 2016. ^ "Tragedy of student in tram horror". Manchester Evening News. 15 February 2007. Retrieved 27 March 2016. ^ "Boy, 16, in tram tragedy". Manchester Evening News. 30 June 2005. Retrieved 27 March 2016.